The ICE lines Heidelberg Stuttgart-Cologne, Zurich, Frankfurt, Hamburg and Stuttgart, as well as the ECs / ICs lines of Salzburg and Frankfurt, Dortmund, Stuttgart and Karlsruhe-Stralsund are approaching Heidelberg main train station (Heidelberg Hauptbahnhof) frequently. Heidelberg is centrally located in Germany which makes it easy to arrive by train, plane or car. If you take the car, take the highway A5 / A656 with the direction to "Darmstadt-Karlsruhe/Basel" and the exit junction Heidelberg and Heidelberg Schwetzingen. The biggest international airport Frankfurt am Main is the closest to Heidelberg. With the car the distance is 50 minutes and the public transportation will approach the city within 1 hour. Heidelberg is a city you will fall in love with. The historic charm, the scenic location, castle ruins and character of the inner city makes it to the mecca for international day-tourists. Heidelberg is one of the few german cities that were not destroyed in World War II. The city is known worldwide as one of the most famous cities in Germany and as a commercialized holiday destination. It's castle ruins, and the oldest university of Germany are impressive attractions throughout the stay in Heidelberg. It attracts scientists and tourist from all over the world. A special feature is the baroque old town which was rebuilt on medieval ground plan. In the old town, which has one of the longest pedestrian street in Europe with 1.6 km length. Besides the world-famous castle and historic town streets Heidelberg also offers a modern scientific and economic center of international repute and a vibrant diverse culture. There are certainly many beautiful places in the world where you can take a romantic walk. The City of Heidelberg is something really special. It lends itself easily to enjoy the time together. Lovers have plenty of opportunities to enjoy the togetherness right, because there are a variety of romantic places in this city. The area in the middle of Germany invites to linger and dream, just perfect for a romantic walk with the partner between the Old Bridge and the stunning castle with an astonishing cultural and event offer and a savory and hearty cuisine possibilities. Tip: "A romantic stroll along the philosopher's path (Philosophenweges)." This path leads sooner or later the lovers to a small Philosophers' Garden. From this little corner of the world not, only romantics will certainly be impressed. The subtropical plants exude charm of their own, which certainly no one can escape. Stroll along the pedestrian streets of Bismarckplatz on the market square with town hall and church of the Holy Spirit. Then go to the old bridge (Karl Theodor Bridge). On the Bridge Gate, there is a "bridge monkey". It says if you stroke about the mirror it brings you prosperity. Find the red Panda hidden in the branches or watch the bubbly elephant bachelors taking a dip; there is a lot to see in the Heidelberger Zoo. For animal lovers it's is definitely the right place, because, in the past decade, the Heidelberg Zoo has developed into a modern zoo with clear didactic concepts and focus on specie's protection.The prices are from 8,40€ for adults and 4,20€ for children. First Saturday of June, July and September, there is a special event in Heidelberg. The events' name is "Schlossbeleuchtung". On these days, bengaline beacon dive Heidelberg Castle slowly into a mysterious red firelight. It is as if the ruin would burn a second time in its long history. Also, the "Alte Brücke" and the "Altstadt" are lit up with amazing fireworks. Even for inhabitants it's a picturesque event. Heidelberg is one on the most beautiful cities in Germany, also famous for its prestigious university. This Leonardo hotel is 10 minutes walking distance away from the historic old town of Heidelberg, and a 8 minutes’ walk from the Nekar River. Woods, and hiking trails area also very close. The rooms are spacious, modern and the restaurant not only has a nice breakfast buffet but also a great cuisine with regional and international cuisine. 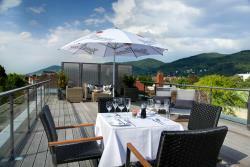 Dating back to 1865, this luxury 5 star hotel in the heart of Heidelberg’s historic centre offers a modern spa centre and views of the world famous castle. High speed Wi Fi is free for guests. These suites and apartments provide a beautiful place to stay in Heidelberg. They are located on the River Neckar, next to the Old Bridge and a short walk from all attractions. This new, 4-star hotel in central Heidelberg offers modern rooms, an underground parking garage and a stylish restaurant. Heidelberg Main Station and the historic Old Town are a 10-minute walk away.